For more information on the opportunities below, as well as others, please visit our PWS Clinical Trials Opportunities page or clinicaltrials.gov (and search for "prader-willi"). We encourage members of the PWS community to seek out information that will help them decide whether participation is right for them. Please contact the study coordinators directly for important details about each study and to answer any questions you may have. Some trials may have funds available to support travel to study sites. In addition to new studies, there may be changed criteria for older studies, so please read through carefully, check out the webpage, and see how you might be able to contribute. A new study is being conducted by Researchers at the University of California, Los Angeles. The study will investigate cognition and behavior in individuals with PWS. You can participate if you yourself have PWS or if you are the parent of a child between the ages of 12-50 with PWS. Participation may take up to an hour and a half. There is no travel required as the study is web-based, which means that you will be asked to complete online clinical and neurocognitive forms. If you have any questions about this research study, please call Laura Pacheco at 310-825-3458 or send an e-mail. Find more information here; to participate, please click here. Dr. Ann Scheimann and colleagues at the Johns Hopkins Children’s Center in Baltimore, MD will be studying the effects of a carbohydrate restricted diet in school age children (ages 6-12) with PWS. Dr. Scheimann will examine the impact of a modified Atkins diet on growth, weight, anxiety and hyperphagia. For more information, please email Grace Felix, MD or call to speak to Grace or Ann Scheimann, MD at 410-955-8769 option 7. Dr. Eric Hollander and colleagues at the Montefiore Medical Center in New York are performing a Phase 2 study of oxytocin in children (ages 5-18) with PWS. The study will determine the effects of intranasal oxytocin or placebo on hyperphagia, repetitive behavior, and social function. A description is provided here and details of the trial are here. For more information, please contact Casara J Ferretti, MS, by phone at 718-920-2910 or by email here. Dr. Anastasia Dimitropulos and her team at Case Western Reserve University have two ongoing, remote studies focused on optimizing development in children with PWS. The PRETEND study is recruiting parents of children ages 3-5 for a training program aimed at increasing learning and play, and decreasing problem behaviors. See recruitment details here. The Telehealth Intervention Study is recruiting children ages 5-11 to build social-emotional skills through a play-based intervention using videoconferencing. See recruitment details here. For questions on either study, contact Anastasia Dimitropoulos and the Research Team via email or by phone at 216‐368‐3471. Dr. Kate Woodcock is studying “task switching” difficulties in PWS, with the goal of developing tools and techniques to help those with PWS cope with unexpected change. Her group is recruiting for three studies related to this challenge, for children ages 5 - 16 years. Dr. Woodcock is located in Ireland, but the studies can be completed remotely by phone or online. More details about each of the studies can be found on FPWR's website here. Scientists need samples to study PWS – without your contributions, these studies can’t make progress! Got baby teeth? Share them with Dr. Reiter. Fresh baby teeth are needed, particularly from those with PWS by UPD. You must have a kit ahead of time. More details here. Got cord blood? Consider sending a sample of cord blood from your child with PWS to Dr. Lalande, see details here. INSYS Therapeutics is planning a Phase 2 study of Cannabidiol (CBD) for individuals with PWS ages 8-65. The company will test the effects of their pharmaceutical CBD solution on hyperphagia-related behavior and weight. The study is not yet recruiting, but we'll let you know when it starts! Alize Pharma has developed a drug targeting ghrelin, the “hunger hormone” abnormally elevated in PWS. AZP-531, an unacylated ghrelin analog, could potentially reduce hyperphagia in PWS. The company recently completed a study in PWS. The results were reported at the International Prader-Willi Syndrome Organisation meeting in Toronto, and are summarized here. Dr. Merlin Butler and colleagues recently published their findings of a pilot study examining the ability of transcranial direct current stimulation, a weak, noninvasive form of brain-stimulation, to reduce food craving and hyperphagia in PWS. The research team is currently completing the first phase of a larger follow up study to determine if tDCS is aneffective noninvasive treatment to control food cravings and overeating in adults with PWS. Anyone considering participating in a clinical trial should discuss the matter with his or her physician. FPWR does not endorse or recommend any particular studies. 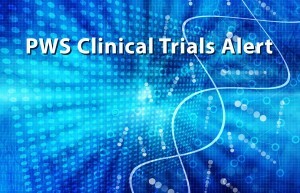 For updated information on PWS clinical trial opportunities and to sign up for a monthly PWS Clinical Trial Alert, visit the PWS Clinical Trials page.